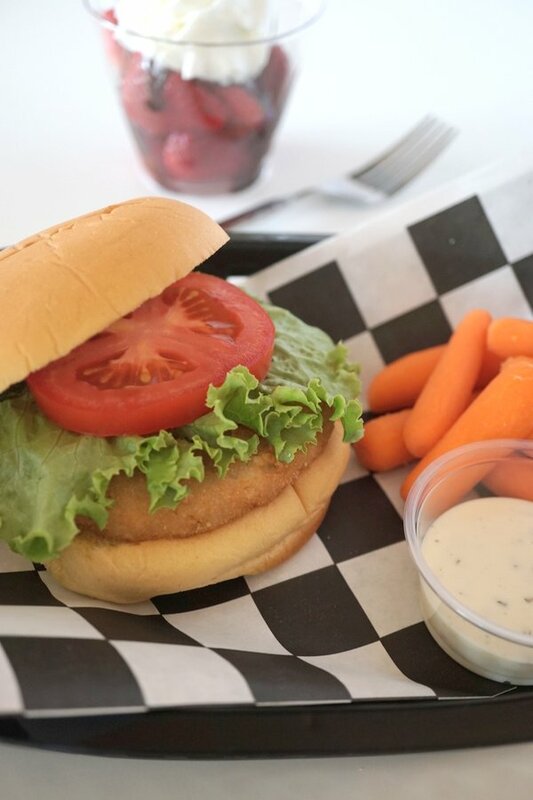 Take a break from cooking tonight! Pick up a few items at the grocery store, prep, assemble and enjoy a healthy, affordable, complete meal your family will love! The reality is… I do not cook a homemade meal every single night! I intentionally plan a “Grocery Store Meal” for one meal a week. (Sometimes 2-3 times per week if life is extra crazy-busy!) I have several “go-to” meals that I rely on and I’ll be sharing them with you over time! Please keep checking “Grocery Store Meals” in the Meal Index for ideas! Grocery stores are full of plenty of products that help make mealtime easier. However, it’s still important to be picky, read labels, and purchase products that are high quality. I still want to feel good about feeding my family a healthy meal even though I’m taking some shortcuts. My intention is to put together meals that are healthier and more economical than take-out or the drive-thru of a fast food restaurant. Just 4 items! 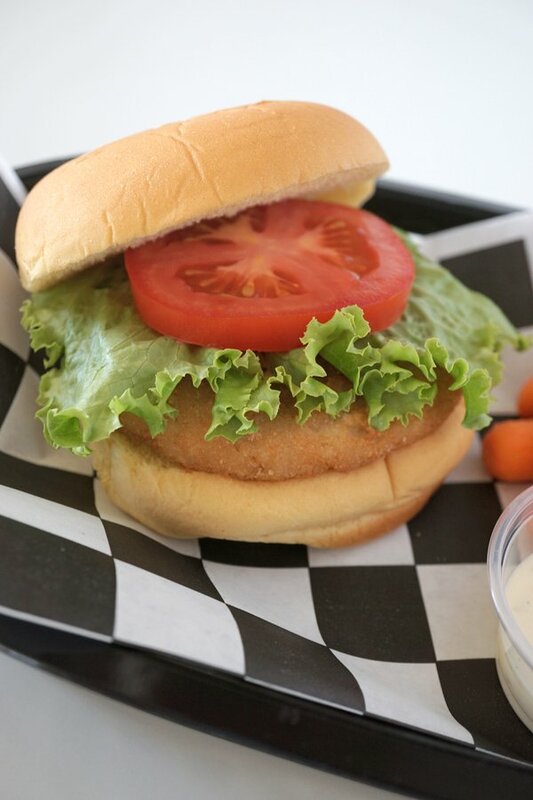 Breaded Chicken Patties, Sandwich Buns, Green Leaf Lettuce and a Tomato! I’m a fan of Applegate because their products are high quality and don’t contain any filler or junk. Plus they claim that their meat is sourced from family farms where animals are raised responsibly. I can get behind that! You can find this 4 pack of Chicken Patties in the Freezer aisle. I grabbed them when they were on sale for $6.99 (normally $7.99). That’s only $1.75 per person! You may find other products that are less expensive, but be sure to read the ingredient list and nutrition facts. 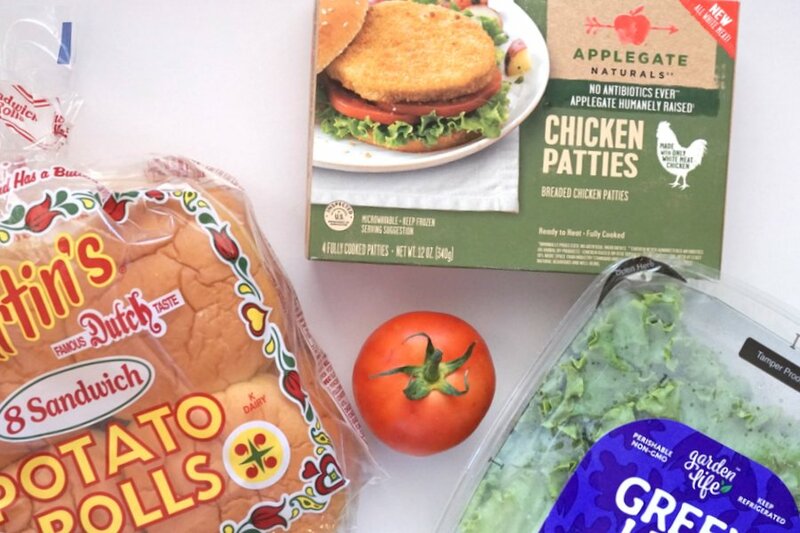 Choose any sandwich bun you prefer and grab a tomato and some lettuce. 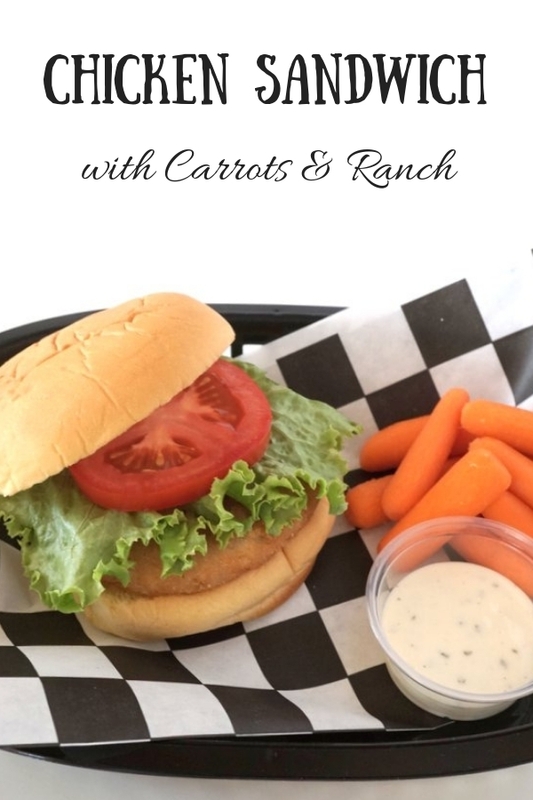 (Bonus… you’ll have leftover lettuce and buns for additional meals!) 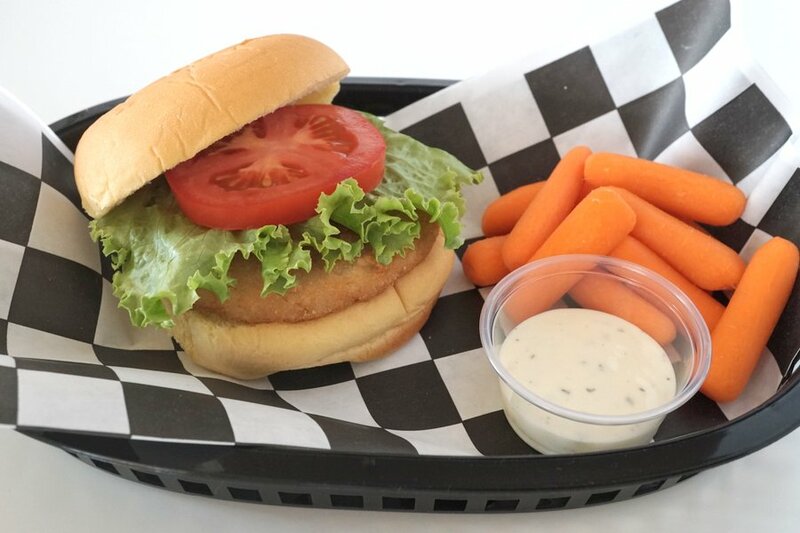 I kept my bun plain, but you could also add a little mayo, some ranch or even hummus for a little extra flavor. These chicken patties cook up in just 18 minutes in a 425 degree oven. You can also nuke them in the microwave, but the oven is preferred and recommended. Besides, while they’re heating up, you can slice up the tomato and strawberries (see dessert below). 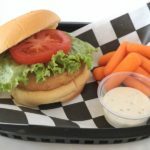 To make this meal even easier, I like to use fun, reusable trays that I purchased on Amazon (affiliate link)! They’re great for sandwiches, hamburgers, hot dogs and other casual meals. You’ll feel like you’re eating out because they’re just like what the restaurants use! Clean up is a snap because there are absolutely no dishes to clean! You can also buy colorful paper (affiliate link) or even just lay down a napkin. I highly recommend this product if you’re looking for a practical and unique way to serve some of your meals! Carrots are the only raw veggie that my kids will eat so I use them as a simple side dish frequently. They’re awesome dipped in your favorite Ranch dressing or hummus. Leftovers are perfect for snacking on during the week! I’m trying to steer you in a healthy direction, however, if you’re craving some potato chips they do make a nice side too. Sometimes we’ll do both baby carrots and chips as a compromise! Desserts do not always have to be cookies and other high calorie, sugary items! 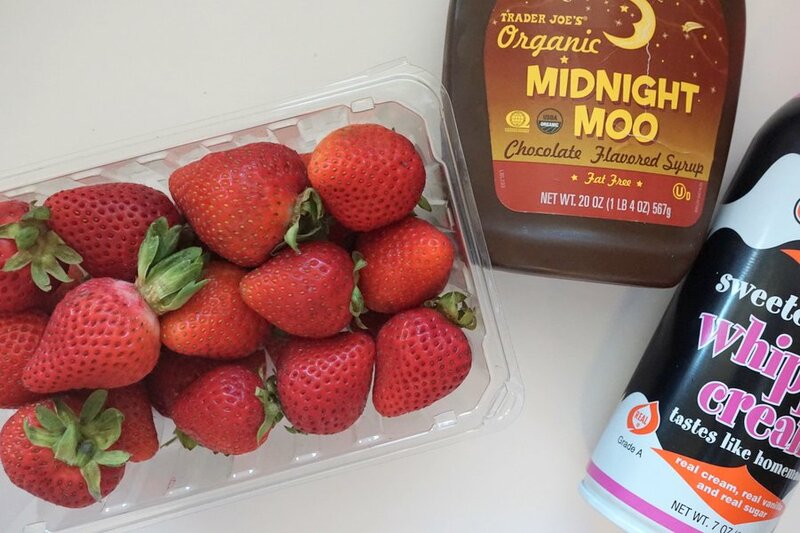 Top off your meal with a serving of berries jazzed up with some chocolate sauce and canned whipped cream! Simple yet satisfying! Any type of berry will do. This meal comes together in less than 20 minutes, is great for dinner or lunch, and feeds a family of 4 for less than $25 ($24.62 to be exact, not including the whipped cream and chocolate syrup, which is a staple in our fridge!). Bonus… you’ll have leftover ingredients to use in additional meals or snacks! This healthy meal comes together quickly and easily with some help from a few items you can pick up at your local grocery store. Heat chicken patties according to package directions. Meanwhile, slice the tomato and strawberries. Assemble chicken sandwiches, spreading mayonnaise, ranch or hummus on bun. 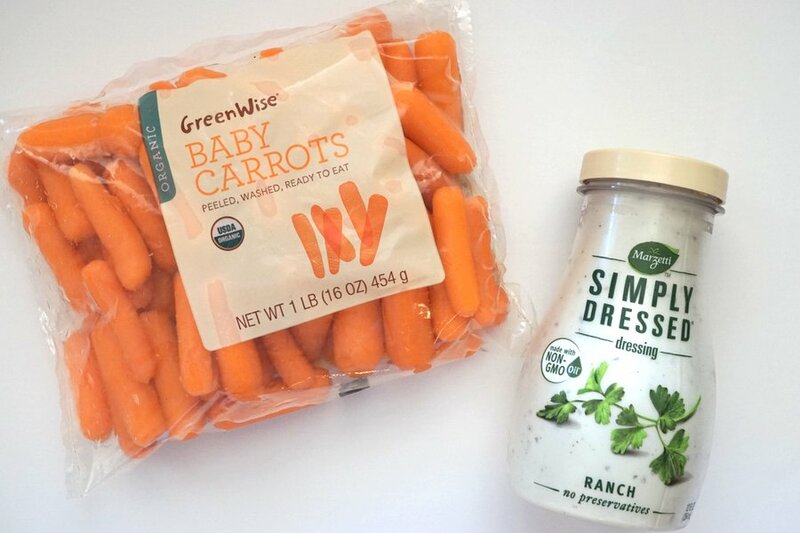 Serve baby carrots with Ranch or hummus for dipping. 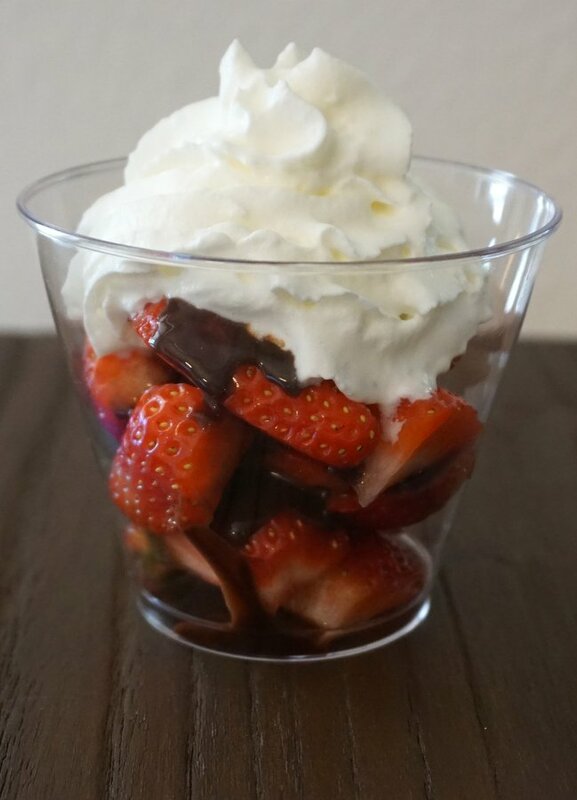 Serve strawberries in a small bowl with chocolate syrup and whipped cream. Enjoy!